A summary of financial information regarding the Council’s income and expenditure for the year is included, including a summary of the major areas of capital expenditure for the year. In addition, the Annual Report also sets out the external funding coming into the District from the Greater Birmingham and Solihull Local Enterprise Partnership and Staffordshire and Stoke-on-Trent Local Enterprise Partnership. In total this external funding investment was £1,161,000 during 2017/18. 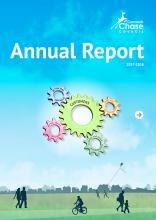 A copy of the Annual Report is available to download below.